Anyone heading out on a fall color excursion this week will not be disappointed. Fall foliage has reached its peak in the higher elevation (above 5,000 feet) and is now descending into areas between 3,500-4,500 feet. In this mid-elevation range, trees are currently around 50-75% in transition, depending on where you’re viewing. In the Asheville area, the color transition is around 20-30% with an abundance of asters and goldenrods on display. 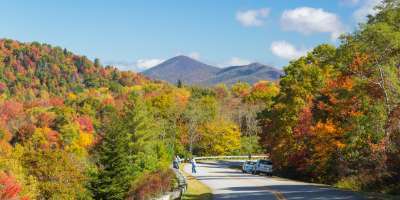 Traveling south from Asheville along the Blue Ridge Parkway, and heading up towards Mount Pisgah, Parkway officials are reporting stunning color coming from Sourwoods, Red Oaks, Tulip Poplars, Maples, Poison Ivy, Virginia Creeper, and Dogwoods. 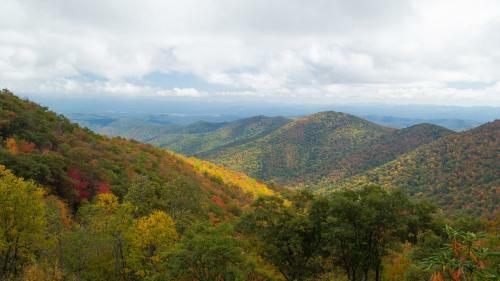 Beyond Pisgah, the patchwork of color begins to lessen, and rusty oranges and yellows dominate the landscape. Although color has begun to wane at some of the highest elevations, those areas are still great places to view bright foliage glowing from the surrounding areas. And with beautiful sunny days and cool nights in the forecast, color should continue to spread into the lower elevations as the week continues. Max Patch (elevation 4,630 feet): Located west of Asheville along the Appalachian Trail is another grassy bald with a stunning 360-degree view. On a clear day you can see Mount Mitchell towering in the east, and the Smoky Mountain National Park miles away to the west. Take your camera and your hiking boots and trek along the 2.4-mile loop surrounding the peak. 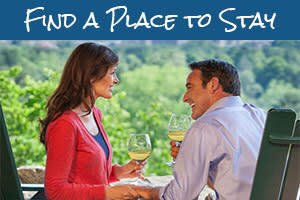 It’s also a great spot for a mountaintop picnic. To truly enjoy the beauty of this area, it’s important to understand its history and how this national forest almost fell victim to the timber industry. Be on the lookout for a new documentary, First in Forestry: Carl Schenck and the Biltmore Forest School, coming soon to public television. It focuses on the influence of George W. Vanderbilt, Frederick Law Olmsted, Gifford Pinchot and Carl Schenck in the American conservation movement. Chimney Rock State Park: Our color hunter Shannon Quinn says the highest peaks of the Hickory Nut Gorge are seeing the most dramatic changes and color is beginning to creep down into the valley. “We’re seeing reds in the understory of our sourwoods and dogwoods and yellows in our poplars. The Skyline and Outcroppings trails offer a great place for sweeping 75-mile views of our first fall color. The golds of our Hickory trees are just beginning to show.” This season take part in their fall photo contest. The best image will win a vacation prize pack! Check their website for more details. 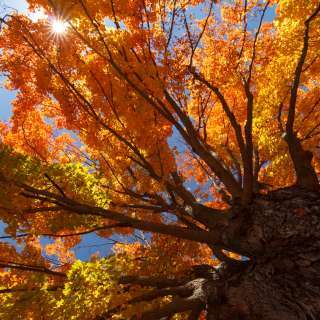 Autumn Escapes: Leaf peeping isn’t all you can do in the woods this fall. The Shoji Spa is offering a seasonal travel package that includes a one-hour soak in a private outdoor hot tub and a chai lavender or whisky-inspired body treatment. This full body exfoliation comes with a luxurious body butter massage, and is enhanced with warm stones. 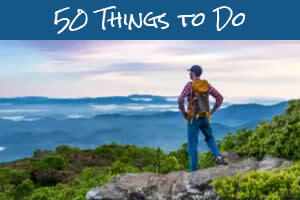 Downtown Asheville: This weekend the downtown area will be buzzing with events. Some things you definitely want to check out include Asheville Art in the Park on October 17. Here you’ll find handcrafted arts across a variety of mediums including glass, ceramics, wood, jewelry and metal. On October 18, grab some kugel and listen to the sounds of traditional Israeli music at this year’s Hardlox Jewish Food and Heritage Festival.